The Thursday night lineup of our 2015 Austin Imposition at the Longbranch Inn was initially riddled with secret guests and covert band names so as to not alert the local beast and publicly defy its decrees. It’s a measure that must be taken when the lineup is top to bottom loaded with bands on the verge of ascension to that place where Pitchfork reports their breakfast receipt and bands are groomed for Late Show sets and brands fund entire tours in exchange for a logo on the bus and an actual bus exists. 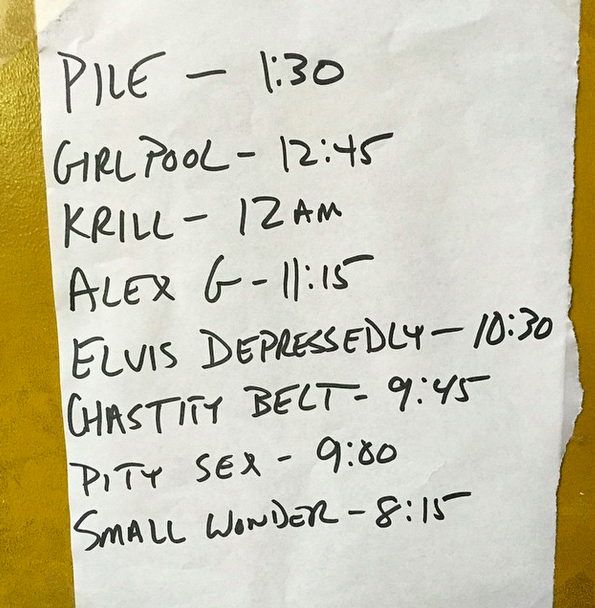 We packed bands like Girlpool, Alex G, and Pile into an East side dive in Austin where the din of “No Flex Zone” was distant, the branding was less visible, and the smell was a mix of sweat, lingering weed vapor, and Jamaican street meat from a nearby food truck. LANDR, a digital mastering service, was on hand to record the night and mastered the sets. Mid-set banter, tune-ups, and plenty of bad jokes are kept intact to preserve the night’s casual gathering atmosphere. Krill might have been late, but there was no stage manager to their left pointing at a wristwatch. And yet, the urgency exacerbated each song’s anxiety and brain problems became frenzied panic attacks fed into their instruments. Chastity Belt locked into a groove that captivated as singer Julie Shapiro questioned “I think we’re having fun,” while Pile assisted with last call, but played with indifference to a looming closing time. Perhaps it was Rick Maguire of Pile who said it best: “This is a lot of fun. I got to be honest… hanging out with friends into the wee hours. It’s just a good time. I’m having a good time, guys.” Was it eloquent? Not exactly, but it articulated the mood. Bands played sets and hung around for the remainder of the night and we were all where we wanted to be for that evening. For more Austin Imposition sets, check out the Wednesday night showcase streams with Meishi Smile, HYDRABADD, and Monster Rally.